Frederico Domondon was hired in mid-January 2003 by Papillon Restaurant Francais in Fremont, to play the piano weekly in the restaurant where his paintings are on permanent display. Frederico was entertaining his friends by playing the piano by the bar when the owner of the restaurant offered him the job on the spot. Frederico played the piano in his teens but stopped ten years ago after he sold his piano and started concentrating on painting full time. Although he has not played in ten years, his talent in piano playing has even improved. He only had two days to practice before he played at Papillon. Amazingly, Frederico has trained himself in the last six weeks to perform over 100 of the most popular songs of all time, and he has done it all "by ear". He has found it helpful to listen to classical piano music by Beethoven and Chopin. Frederico tries to apply everything he's heard to his playing. A customer in the restaurant thought that he was a classical pianist. 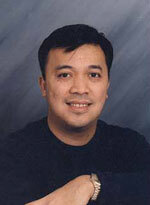 Frederico's current repertoire are themes from movies such as "Casablanca", "Titanic" and "Romeo & Juliet". He also plays songs by the Beatles, the Carpenters, Frank Sinatra and many other great singers. Come and join Frederico to see his art and enjoy his music! Tired of sending the same cards over and over? Now is the time to make use of beautiful and colorful notecards featuring some of Frederico's most popular paintings, such as "Casa Sevilla", "Villa in Palermo", and many others. Truly unique and in fine print, these blank greeting cards are perfect for sending notes for birthdays, anniversaries and other special occasions. Those who receive these cards treasure them forever! The notecards along with other gift items and all of Frederico's paintings are available at domondon.com. 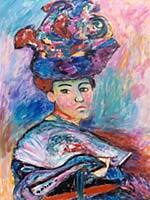 Inspired by Henri Matisse's "La Femme au Chapeau", Frederico's 2003 latest work is "Dominique, the Lady with the Hat". The Matisse original which is in permanent collection in the San Francisco Museum of Modern Art is considered to be the most valuable original painting on the West Coast. Frederico fell in love with the painting when he was working as an accountant in the city eight years ago. He actually painted his first rendition of it in 1997 and sold it within two weeks at the Polk Street Art festival. This Frederico's interpretation of a Matisse is being considered by many as one of his best works ever because of the flow and choice of vibrant colors, as well as the facial expression of the portrait. This 48" x 36" original acrylic on canvas is currently available along with giclees on canvas and prints. To view Frederico's latest works, please visit domondon.com.